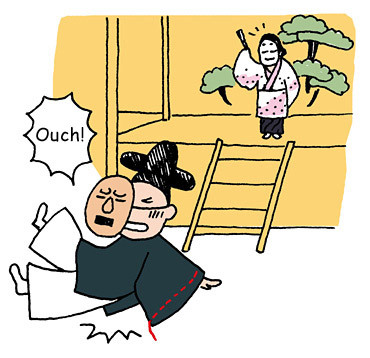 TRIVIA of Noh : Q23 : Do actors ever fall from the stage? | Home | Trivia | Q23 : Do actors ever fall from the stage? Do actors ever fall from the stage? Though it happens very rarely, actors do fall from the stage. When they are wearing a mask, they have very poor visibility and they cannot see their own feet. They need to confirm their positions on stage by watching the pillars or counting the number of steps. Therefore they sometimes make mistakes in finding their positions, especially in a theatre with different measurements or on a specially-installed stage. They cannot suspend their performance whatever happens on stage. If an actor falls from the stage, he will have to return to the stage calmly and continue the performance quietly. In case the actor cannot continue the performance, his supervisor (koken) will normally play his part and continue the piece.